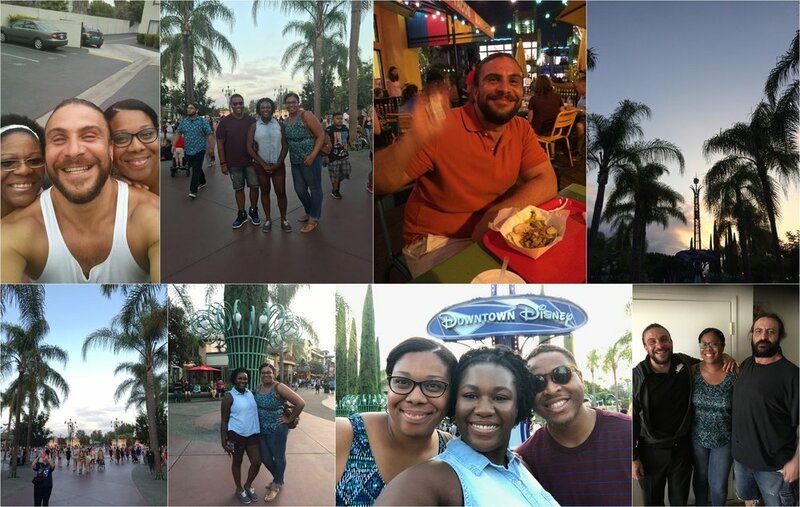 I've been working a lot the last couple of weeks so I never blogged about my trip to California back in September so I'm using it as this week's weekend wrap up! This was my first trip back there in seven years..seven years you guys! My friend Gina got married which is really why my mom and I made the trip. The wedding was gorgeous and served not just as a celebration but as sort of a big church family reunion for us as well. My mom met Jackie (Gina's mom) in church and so Gina and I have known each other since we were babies. I mean, Jackie babysat and even potty trained me.. that's how long I've known them. We moved from Cali to Jersey when I was nine years old and although we all don't speak on a regular basis, I think it is the sweetest thing that not only my mom's friendship with Jackie, but my friendship with Gina is still there after all these years and we are still considered family. My other good friend from church was Courtney. She, Gina, and I were always together at church and it was so sweet seeing her again after all these years. She's a missionary in Mexico and made the trip to Gina's wedding as well. During my short time in California I often thought about how different my life would be if all of the people I'd seen were in it every day. If you've moved as a child you know what I mean. So much has changed in all of our lives and as much as you want to pick up where you left off, sometimes it's just not that easy. That's why I think that friendships that last not only years but distance is something so special and should be cherished as long as it can be because it's extremely hard to come by. Top Left to Right: Courtney, Gina, Me; Gina & Jordan; My mom and some of her best friends from church, Cindy, Jackie, and Loretta. Not only do I have friends out in California but I have family from both my parents families out there too! My mom and I were able to visit my cousins on my dad's side who I hadn't seen since we moved to New Jersey. They're at least ten years older than me so seeing them again was kind of like meeting them all over again but at the same time feeling like I've known them my whole life. We went to Downtown Disney with my cousin Javon and he got to meet my cousin from my mom's side, Jennifer and her fiance Joe. I've talked about Jenn before on the blog (she's The Green Being). Jenn and Joe have lived in LA for the last year for Joe's job so it was great seeing them too because Jennifer and I talk on the phone all the time. All in all it was a great trip and I really want to make a commitment to making it again at least once every year. The older I get the more I'm realizing how having friends and family is truly a gift. I'm so thankful for everyone in my life and although we can't always see each other, and even if we do see each other and don't express it, it's important that they're in my life. There's nothing better than being able to be with the people you love.